Are you filled with nostalgia about that special marketing year at Vlerick? It wouldn’t surpise us that you vividly remember some anecdotes of that year! Do you agree that seeing your former classmates again is always a pleasant moment? And that it’s about time to meet them again? 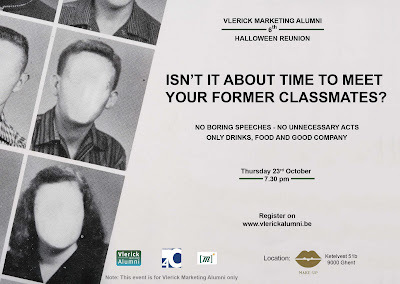 That’s exactly why we are inviting you to the 6th edition of the Vlerick Marketing Alumni Halloween Reunion, and this to celebrate 40 years of marketing at Vlerick. It is thé opportunity for you to become nostalgic while seeing your former classmates again. We offer you delicious drinks & bites in a nice location. And for all the rest we count on you: there are no speeches, no unnecessary acts – just food, drinks & good company. This informal reception is completely free and has become the fixed appointment for about 350 to 400 marketing alumni to meet their former classmates again. At the same time, this is the ideal opportunity to enlarge your network in a casual setting. Your car can be parked at the Kouter or Zuid parking. We would like to ask you to confirm your attendance by subscribing to the following address: events@alumni.vlerick.be (mention surname, first name, program and graduation year).